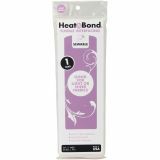 Heat'n Bond Lightweight Iron-On Fusible Interfacing - THERMO-WEB-Heat'n Bond interfacing is great for quilting, home decor, and craft projects. Adds crisp detail to light, medium, and heavy weight fabrics. Use in collars, facings, pockets, and detail areas. No pinning, basting or shifting. Fuses in seconds. Machine wash and dry cleanable. Size: 20 x 36. Made in USA.